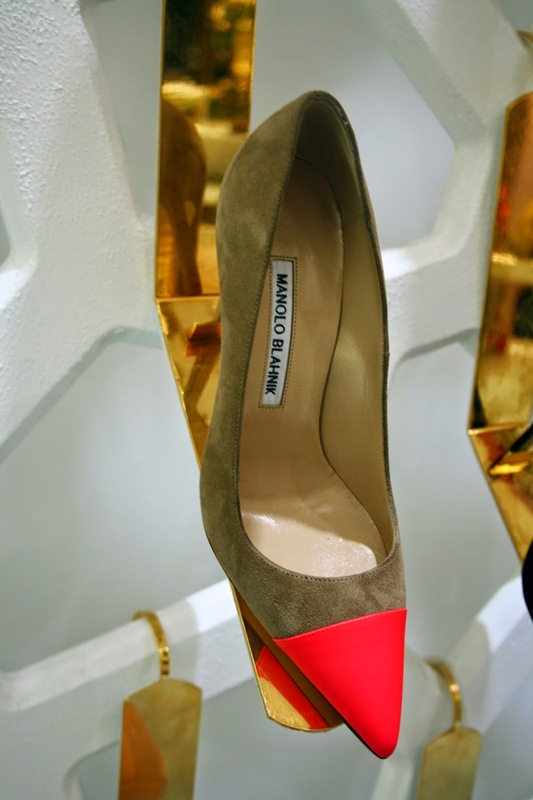 Manolo Blahnik shoes simply carries a perfect combination of art and classiness, I don't own one just yet but my life some times feels like I'm living until the next shoe purchase..
And come on you must admit don't you get a flashback from Carrie Bradshaw whenever you spot a pair of Manolo's ? I think one of the reason I haven't purchase a pair yet would be that their delicate satin and whenever I purchase a new pair they'd go on rotation until I find another pair to abuse, but the touch of pearls added to the classic Hangisi if you have a weakness towards pearls..
Also as if my thoughts were heard, for wishing that the Hangisi would come in leather they came in leather but flats only and I'm not quite so keen on the all gold embellishment even though it looked nice on the pale pink shade along with gold.. The combination of the neutral suede and neon leather was a perfect match for those pumps as well, even though I have my perks when it comes to suede couldn't resist them and the cap toe affect was a lot more brighter in reality..